Q. Tell us about Pope Benedict’s devotion to Our Lady of Altötting, the patroness of Bavaria. A. Pope Benedict’s devotion is a natural for a man born in Bavaria. Devotion to the Black Madonna began there in 1330. Her shrine attracts about a million visitors annually. Joseph Ratzinger visited there as a boy and his father made a 28.5-mile pilgrimage on foot to the shrine in gratitude for his sons coming home safe from World War II. When Joseph Ratzinger later visited Altötting as pope he left at the foot of the statue the ring he had worn as a cardinal. Q. How has this devotion shaped Benedict’s life and work? Q. How does the Pope see Mary’s importance for Christians? Q. Why did you decide to write about Pope Benedict’s Coat of Arms? A. A coat of arms tells us about a person’s history and gives a glimpse into the soul of the man himself. The pope isn’t going to talk a lot about himself but his coat of arms says a lot. Q. What is signified by the elements featured on the Pope’s Coat of Arms? A. In addition to the papacy’s traditional keys, which recall the keys to the kingdom of heaven, and a papal miter, the coat of arms has a reference to when he was Archbishop of Friesing and Munich. It is an image of a bear laden with a pack and recalls the German legend that a bear attacked and killed the horse of the first bishop of Freising, St. Corbinian, on the way to Rome. Afterwards, St. Corbinian made the bear carry his belongings the rest of the way. Another key element on his coat of arms is a gold scalloped shell. The pope did doctoral studies on Augustine of Hippo and the shell recalls the saint’s tale of a boy trying to dump the sea into a hole in the sand. The futile effort reminded the saint of the futility of any human being trying to fully grasp the infinity of God. 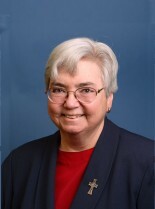 Sister Mary Ann Walsh, RSM, is director of the USCCB’s Office of Media Relations.